Teachers and public servants have continued to plead with the Government to speedily implement a cost of living adjustment to offset what they say is a rise in the cost of living exceeding 30%; and as the New Calendar Year, 2014, has dawned, Prime Minister and Minister of Finance Dean Barrow used that occasion to announce that those workers will be getting a salary adjustment – just not quite yet. In his New Year’s Day speech, Barrow said that the headline grabber is the decision of the Government to pay the raise – but not until August 2014, retrospective to April, the start of the fiscal year. He offered no explanation why the raise would be delayed. The Prime Minister also did not specify the quantum of the raise. He described it merely as “substantial” – pointing to an agreement, in principle, to pay teachers and public officers 50 cents out of every $1.00 government gets in extra revenue. Barrow also announced that effective January 1, 2014, the National Bank of Belize, which Government had previously said would especially target teachers and public officers for lending, would be expanding its portfolio to include small business and vehicle loans – and the ceiling for business and mortgage loans would be $175,000. Since its launch in September 2013, the bank’s lending ceiling has been fixed at $100,000. Barrow also announced a rollout of the National Health Insurance Scheme to the northern part of Belize, as well as a subsidy for students sitting CXCs, starting 2014, through which Government would pay for up to six subjects – but only on the basis of need. Barrow also announced that 2014 would see the reform of the Public Accounts Committee and the reactivation of the Integrity Commission, which has been dormant since 2009. 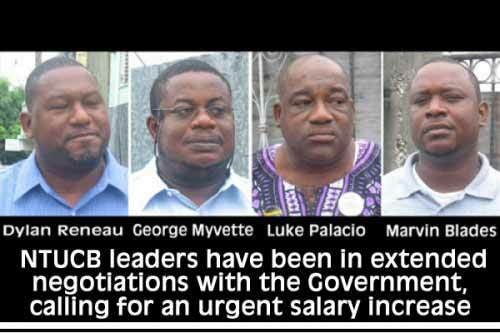 Of note is that the National Trade Union Congress of Belize (NTUCB), in its New Year’s Day message, listed the dormancy of the Integrity Commission as one of the matters they want to be addressed in 2014; but they will also be clamoring for the Barrow administration to activate a provision in the law for the appointment of a 13th Senator to Parliament. At his last press briefing, though, Barrow was adamant that no such appointment would be made by his administration, claiming that it would result in parliamentary paralysis. The NTUCB said that it will also be lobbying for a seat on the board of the Central Bank of Belize. While Barrow promised a salary adjustment in 2014, the NTUCB has long made it clear that the salary adjustments are urgent. Last May, the NTUCB, on behalf of the 11,000 workers they directly represent, had asked for at least a 5% salary adjustment, amounting to $18 million. The NTUCB now says that an increasing number of people can’t make ends meet. It also said that it will fight for changes to effect a living wage, to replace the minimum wage. One of the key features of the Prime Minister's New Year's Message was the raise of pay for teachers and public officers. The PM spoke of the increase in glowing terms and said it would be "substantial." "The Prime Minister's New Year's message, he indicated that the salary adjustment would be effective in August, retro-active to April 1st 2014. Our understanding and agreement so far with the Prime Minister before his new year's message was that this salary adjustment would have been come effective on the 1st July, retro-active to April of 2014. We do take umbrage and very much concern that the Prime Minister would use his new year's message to give us this - what we consider to be a wrong signal." "We have already gone back to our teachers and convince them to let's wait it out and they've only have 6 months waiting tolerance; from January to the end of June and they look forward for July. We can't go back to tell them something different now." "When it appears that the Prime Minister wants to move the goal post, we feel much offended about this and our Council of Management, our membership wants us to demonstrate this in no uncertain terms that we are not satisfied." "When you negotiate you don't allow anybody to be moving the goal post with you. We are not here for that, because you have to understand that a collective bargaining agreement is a binding agreement. If we allow them to get away this time because the collective bargaining is for a three year period, so that next year he'll come and say that we will get it until September and then for the 3rd year he would say that he cannot give us any at all because of so and so. No, we are not for that. We are taking our stand that this salary adjustment should become effective 1st of July." "I was in error when I said August in the New Year Message. I have consulted the relevant Minutes, and the payment month is July. It was a mis-recollection, and therefore mis-statement, on my part, and not a decision to change what was promised." So, there, the teachers will get their raise, as promised in July. But, they're still not completely happy, because with no certainty as to what percentage that raise will be, the unions want assurance. That comes in the form of what they call a floor, a minimum that they would be paid, regardless of how government revenue turns out. "Our union, like the other two unions continue to insist as it relates to the counter proposal that the Government of Belize should grant us or guarantee us a floor as it relates to this salary adjustment." "We know that the Prime Minister has opposed this time and time again. Every opportunity he gets he is saying no to that, but the BNTU and the other unions are saying that is a proposal that we intend to continue to negotiate. We cannot just come and tell us no." Their proposed floor is 5%. And if the union seems especially feisty that's because Belize District President Kathleen Flowers says this is a year when the unions will be more active and engaged as an agent for change in the society taking on everything from corruption to social security injury benefits. She explained this new, higher profile:..
"We are alongside our umbrella organization NTUCB; we are going to be charging after all the national issues that are hurting us everywhere we turn. There is absolutely no issue that the union will let rest this year." "Starting with corruption, corruption to the core of our being and so the union is about to start taking the medicine to the nation. We are bringing all on board - develop that image where the unions no longer only deal with contiguous matters and deal with crisis management. We want to be respected as social partners that play our role and that have a voice and can use our voice. You are going to be hearing of our slogan which we are going to be sharing with you today that we intend to live with and not only preach it "teachers got your back." Not only do we have your back in educating our children in this nation we will have your back to keep the nation turn around." And to start off the increased engagement and activism, the unions will launch a series of public rallies on January 10th in Orange Walk at Queen Elizabeth Park. From there the rallies will move to every district. 0 registered members (), 35 guests, and 11 spiders.